So far in our Kingdom, Power and Glory series we have learned that not only our rewards, but also our place of responsibility in the coming Millennial Kingdom will either be won or lost according to our faithfulness in this life. In other words, the way we live our lives here and now will have eternal and unchangeable consequences in the future reign of Christ. All believers will be with Christ in the Millennium, but only the overcomers—only those faithful and obedient believers who recognize their choices and allow Christ to live His Life out through them—will inherit levels of responsibility there. Consequently, there is an urgent need in the body of Christ for a renewed recognition of our own accountability and a refreshed understanding of the reason for our salvation. 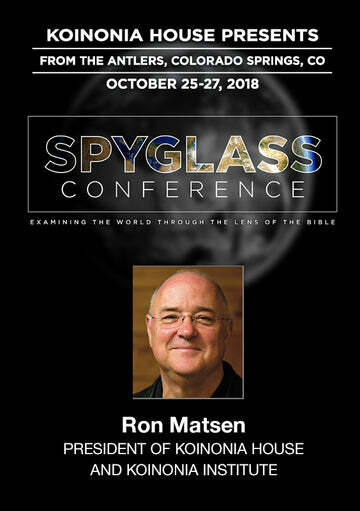 Speaking of the importance of our accountability, let’s look at how Paul, the great apostle, viewed entering and inheriting this future Millennial Kingdom. The word “lest” (Strong’s #3381, mepos) in the above Scripture means “God forbid that I should.” The word “castaway” (Strong’s #96, adokimos) means someone who is unapproved, rejected and worthless. It means someone who is tested for proof, but who fails the test (is not able to withstand it) and is, then, rejected. “Castaway” means one who is not worthy (axios) of inheriting because he is not fit, prepared or ready. What is it that the apostle Paul was so intent about keeping, while at the same time, acknowledging that it could be lost? He never doubted his “justification” for a moment, as he preached in Romans 8:38-39 that “nothing would separate us from the Love of God.” But he was concerned about losing the prize of the reward of inheritance (Colossians 3:24). “Saved, yet as by fire” means “barely saved,” or saved with difficulty. “Loss” in this Scripture means to forfeit one’s inheritance or forfeit something that could have been in one’s possession. Who is Paul talking about here? Non-believers? No way. He is talking about believers because according to the above 1 Corinthians 3 Scripture these people are saved in the end. He’s talking about “believers who suffer loss.” They became “castaways,” not worthy of inheriting. Just as Paul, himself, agonized and strained every muscle of his being as he sought to win the prize of the high calling, so He is exhorting every one of us to “lay aside every weight and run the race.” (Hebrews 12:1) He wants us to win! (1 Timothy 6:12; 2 Corinthians 11:25-28) He doesn’t want us to be “over-taken” by the world, the flesh and the devil, but to be “over-comers.” He wants our “works” to withstand the test of fire, so that we are welcomed into the kingdom and win the prize. 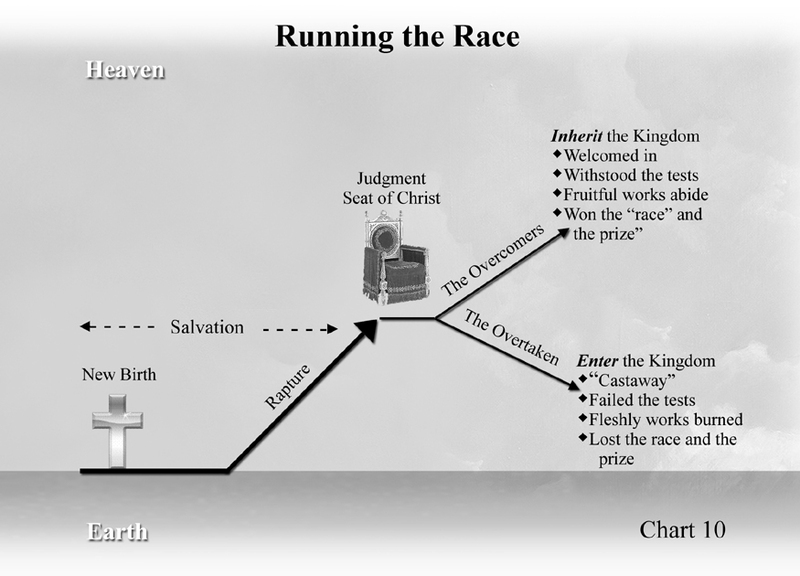 Justification is a “gift” that is bestowed upon us without a price, and earns us a place in the kingdom;5 whereas, experiential sanctification is part of a “prize” gained through performance.6 All of us can run the race, but only the overcomers will win the prize. Our life here and now just happens to be the “testing ground” or the proving ground to see how we do in that race. It’s the score card! Every choice we make and every action we take is being registered and weighed for approval in the next life. There are five books in heaven that record everything we do here and that will be opened and read at the Judgment Seat of Christ. As we said, being “born again” simply enters us into the race. But then, like Paul, we must each press on toward the “goal,” or the prize of the high calling in order to finish the race. God has given each of us different talents, abilities and giftings to advance the Kingdom of God here on earth. The question is: What have we done with these talents? Have we used them wisely, squandered them or buried them? Next month we’ll study the Parable of the Ten Talents and see what consequences are in store for those who fail to win the prize. Next Month: “The Parable of the Ten Talents.” This article has been excerpted in part from Chuck and Nan’s new book The Kingdom, Power and Glory. 1. Word Studies in the Greek New Testament, Vol. 3, page 114-115. 2. Martyn Lloyd Jones, Life in the Spirit, Page 78-80, 363-364, 370. 3. Hebrews 12:1; Luke 6:22-24. 4. Matthew 5:1-12; 6:1-13; Revelation 11:18; 22:12; Luke 14:12-14; Philippi-ans 3:14; 2 Thessalonians 1:4-5; Revelation 3:21. 5. Romans 6:23; Ephesians 2:8; John 3:15-16; 17:2; 1 John 5:11. 6. Colossians 1:12; 3:24; Ephesians 2:10; Revelation 21:7. September 2010 Personal Update News Journal.